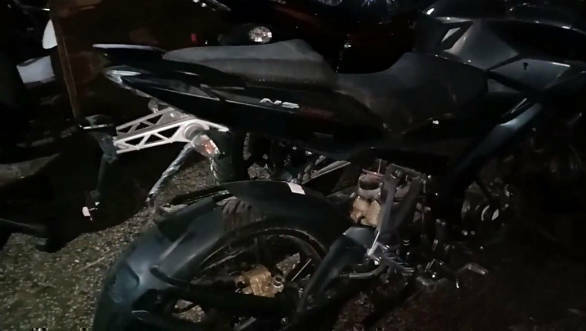 A video has appeared on Youtube showing a new variant of the Bajaj Pulsar NS160 equipped with rear disc brakes. The video also shows the motorcycle to have a new alloy wheel design, similar to the one seen on the recently updated Pulsar 150. No changes are expected mechanically. This means that the premium commuter motorcycle will continue to be powered by a 160.3 cc, four-valve, single-cylinder engine producing 15.5 PS and 14.6 Nm. The engine is paired with a 5-speed gearbox. Weighing in at 142 kgs, the NS160 sits on a double cradle frame from the NS200 and comes with telescopic forks up front and a mono-shock at the rear. A new rear disc is most likely a 230mm unit. This could also have been a good opportunity for Bajaj to introduce ABS but the cost might have been a factor in this decision. The Bajaj Pulsar NS160 is already a popular model and this addition helps to improve the bike's safety credentials. The Bajaj Pulsar NS160 competes with the likes of the TVS Apache RTR 160 4V, Honda CB Hornet and Suzuki Gixxer. No prices have been revealed for this new variant but expect to pay a premium of between Rs 2,500 and Rs 3,000 for the new additions.